Here is a new bike imagined by designer Oberdan "Obiboi" Bezzi, tapping into the growing adventure market, but seemingly being a better offer than what we can currently get our hands on. The fact that the industry seems to miss out the purpose and functionality of a real adventure bike and keeps on delivering only liter-plus behemoths is old news. When and of one/ any of the big manufacturers will turn once more to the middleweight segment is anyone's guess, but until then we have plenty of ideas from the designers. Even though a mere rendering, Obiboi's Baja version of the Yamaha MT-09 has a huge potential, most likely because it was imagined as being part of the Dirtiest Sons line-up. That is, a custom build crafted using bolt-on parts in a kit, with no hacksaw or welding machine involved. 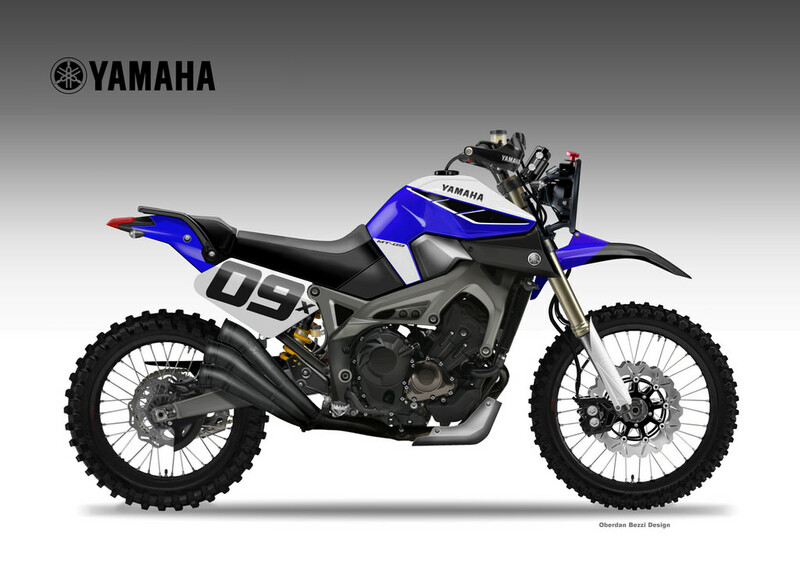 Yamaha has been on a custom bike spree lately, asking both notorious builders/workshops and designers to come up with ideas that could make it into mass-produced kits. The MT-09 is a good platform for an adventure bike, especially if supplied with several new parts. The list includes new, taller suspensions that can take on rough trails and will not make riding on rocky terrain a very dangerous nightmare, dual-sport knobbies, a bash plate, wider foot pegs, handguards and maybe, the possibility to install a navigation/roadbook cluster. On the engine side, even without re-gearing the transmission, the Yamaha MT-09 could prove an interesting option, to say the least, with a new exhaust being probably one of the first modding jobs that come to mind. Such a project is doable, and with so many aftermarket suspensions to choose from, it's even strange that we haven't seen someone make such a bike. Even though we are halfway in dream territory, the main idea behind Bezzi's Yamaha MT-09 Baja is what matters most. And the idea is that the market needs more middleweight-engine, lighter adventure bikes. One of the latest machines to join the show is the new Honda, but here is why we think that the Africa Twin doesn't tick all the boxes.